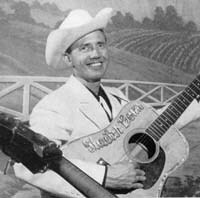 Skeeter Bonn was a native of Sugarville, Illinois and gained some fame as a renowned yodeler. They called him the "Pickin' and Singin' Boy". He grew up early one might say. He left the family farm when he was just 13 years old and moved to Canton, Illinois. In 1942, he joined the U. S. Navy and was honorably discharged in 1946. In 1949, he won the Illinois championship as a singer. He played Spanish guitar, sang hymns as well as ballads and semi-pop numbers. Around 1953 or so, we was starring on the WWVA Jamboree out of Wheeling, WV each Saturday night. But later in 1954, he was appearing on the WLS National Barn Dance. While at WWVA in Wheeling, West Virginia in the mid-1950s, Shirley Starr joined Skeeter's troupe in 1956. Prior to joining Skeeter and the gang, she appeared on shows with Ernest Tubb and worked with Abbie Neal and her Ranch Girls, including some television films. She worked the summer of 1955 with Doc Williams and the Border Riders, doing appearances with them throughout the Unites States and Canada. In one of his old souvenir folios, and we're surmising it was published around 1957 or 1958 judging by the dates listed, we learned that Skeeter and his group traveled over 100,000 miles a year to do their personal appearances. He married his wife Mary Louise on New Years Eve in 1945. and the father of three sons, Ricky, Randy and Terry.